15-March-2014 – Exclaim Marketing, Web and Print is pleased to present A Brush of Colour Painting and Interior Design’s new website. Those who are interested in interior painting, exterior painting and interior design can visit the website today at www.brushofcolourpainting.ca. Brush of Colour’s work encompasses all of the necessities for interior painting, design and drywall work, as well as exterior refinishing, painting and staining. The newly launched website is informative, easy to navigate and puts our clients in touch with experienced and dedicated professionals. Brush of Colour has been in business for over ten years and have a long history of using high quantity materials utilizing the best of workmanship practices. They follow strict policies and procedures with safety being top-of-mind. They exceed client’s expectations with uncompromising standards making clients requests a reality. If clients need the advice of a colour consultant, this service is offered free of charge. With larger, more complex projects, arrangements for a consultation with an Interior Designer is also free of charge. Brush of Colour will provide a written estimate and adhere to it. "I am very proud to announce the launch of our new website. 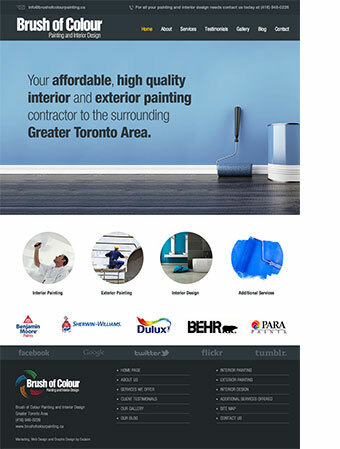 As the owner of A Brush of Colour Painting, I wanted to take this opportunity to introduce the Toronto area’s hardest working service provider of affordable, high quality interior and exterior painting. We use the best of products from Benjamin Moore, Sherwin-Williams, Dulux, Behr and Para.” says Ed Spence of Brush of Colour Painting. "I invite you to visit our website today at www.brushofcolourpainting.ca to connect with me personally and see what Brush of Colour can do for you." About Exclaim Marketing, Web and Print Established in 2004, Exclaim Marketing, Web and Print is the leading provider in the Toronto area for marketing, web and graphic design, printing, branding and search engine optimization (SEO) services. A hard working creative agency, Exclaim is driven to provide marketing, web and print solutions that change attitudes, provoke action and improve the businesses of its community and stakeholders. Exclaim is a small independently run, creative agency that’s big on ideas and strategies. At the heart of it all is their passion for helping clients create an effective and affordable message that reaches the intended target markets. Find out today why you can’t afford to not work with Exclaim on your next marketing, web or print related project. Call them today at (416) 889-8345 and see how their marketing services can help your small and medium-sized business get more customers!